This week, I filled some common acorn squash and some multi-toned ‘Carnival’ squash with a simple saute of ground chicken, tomato paste, Worcestershire sauce, red wine, and sage leaves. The result? A seasonal main course that belongs on your dinner table. Subscribe to my email updates by clicking here. A hearty main course for a cold autumn evening. Preparing the squash -- Center the oven rack, and preheat oven to 425°F. To insure the squash will stand up straight, slice off the little point located at the blossom end of the squash. Then slice off a "lid" from the stem end, just as you would for a jack-o-lantern. Save the lids. Plunge a soup spoon into the exposed flesh, and scrape down and around to remove seeds and stringy fibers. Roasting the squash -- Stand the squash upright on a baking sheet, and brush the exposed flesh and cavities with the melted butter. Roast until the flesh is definitely tender -- about 40 minutes for common green acorn squash; about 1 hour for 'Carnival' squash. Making the filling -- In a large, non-stick skillet, cook the ground chicken over medium heat, breaking up the meat with a wooden spoon as it cooks. Transfer the finished chicken to a bowl, and set aside. Then add the olive oil and minced onion to the skillet. Lower the heat, cover the skillet, and let the onion sweat until soft -- about 5 minutes. Return the chicken to the skillet. Then increase the heat, and stir in the wine, Worcestershire sauce, tomato paste, salt, pepper, thyme, and sage. Stir thoroughly to combine. Then stir in the cold corn starch solution. Filling, baking, and serving the squash -- Spoon the filling into the cavity of each acorn, and top with a generous pinch of the shredded Parmesan cheese. Bake in the hot oven just until the cheese melts -- 5-10 minutes. Plate the squash with the lids arranged on top, and serve. Wine pairing: Cabernet Sauvignon. Hi, Kevin! This recipe looks absolutely delicious! Thank you! I think fresh sage leaves are a garden essential: the plants are lovely, the pollinating insects adore the flowers, and the leaves are to die for in cooking. I love them on pasta, gently fried in garlic and butter til they get slightly crispy. Heaven! They are easy to dry for our long northwest Montana winter use. Just put a single layer of leaves between two paper towels and microwave on high for one minute. Store in a glass jar for great sage flavor while the plants are asleep. Hi Kathy – Thanks for the sage-drying tip! Also, thanks for watching the video! This looks like a real yummy recipe and I will be trying it. I enjoyed watching your video and learned something new. I did not know that there was such a difference in the cooking time between those two types of squash, so thanks for the cooking tip. I agree that only fresh herbs are worth using in cooking. Today I will be staying in and cooking all day, as it is rainy here in my part of MI. so I will get lots of cooking done for the week. One of the things I will make is baked Salmon with fresh Thyme and fresh Rosemary on top while it bakes. The fresh herbs put such a great flavor into the fish, then remove them after it bakes and put fresh lemon over the top of the fish. Will also make a dill sauce to go along with the dip. Happy cooking ! Hi Julie R – The salmon dish sounds fab-u-licious! I haven’t tried the acorn or carnival squash but I have four lovely butternut squash that I grew and two adorable Red Kuri squash that were given to me. Can I convert your recipe using one or both of these two squash and also can I use lean ground beef in place of the ground chicken, keeping the other ingredients the same? (If using beef, should I use something other than sage? Maybe oregano?) OK, now I’m getting hungry! Thanks, Kevin. Enjoyed this video very much! My husband, who has been playing piano since childhood & is now almost 79, and I were very impressed with your piano video! Thank you! I also have copied your winter squash recipe and can’t wait to try it! What variety(s) of sage do you recommend planting for the best culinary use? Lovely piano playing, but not long enough. When you do another video of your playing maybe have the videographer show your hands during the piece. Love your site. I make a vegan version using olive oil to coat the squash. Then I fill it with a sauted mix of diced tofu, black beans, quinoa, tomato, corn, scallions, and garlic. Yummy! Hi Annie – Lots of sage from which to choose! In my opinion, the common variety with gray-green leaves is the best variety for culinary use. 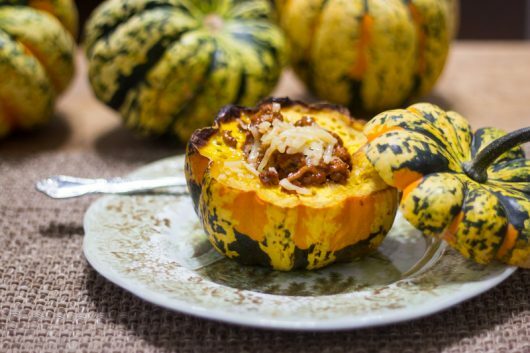 Hi Sheryl – I would definitely love your vegan version of stuffed squash! What a lovely main dish recipe. Most baked acorn squash recipes are just with butter and maple syrup or some variation. 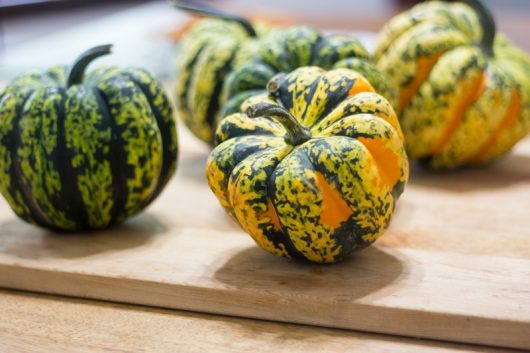 We love stuffed veggies of all types – summer squash like zucchini, onions, peppers, and now winter squash! Thanks Kevin for another lovely dish. I didn’t have a chance yet to watch the video but it sounds like I will be enjoying some piano playing! Oh, and that butternut squash soup recipe? To die for! I’ve made it several times (even converted it for the Instant Pot) and it has been a hit every time. Kevin, It’s always hard for me to get out of the same old/same old – this recipe inspired me. I made it last night as is for my husband and deleting the cheese for my lactose intolerant nephew – all delicious and easy. The greater challenge was for my vegetarian daughter – substituted tofu for the ground chicken – an absolute success! Served with wild rice pilaf and a simple cucumber/tomato salad. Kevin, I can’t wait to try this recipe! I have stuffed peppers in the past, for Halloween dinner parties but this will be something new to try. Will you have any more suggestions that would be appropriate for a fun Halloween dinner party? I made your stuffed acorn squash and it was fabulous! It’s been cool, gray and rainy all day. I couldn’t wait to get home from work and make it. It sure put some Autumn sunshine in the evening! Hi Mary Margaret – Kudos on your tofu-stuffed version! Hi Kerry – Thanks for making this recipe. So glad it turned out well for you! I made this recipe tonight, very tasty and filling. I also dried some of my sage leaves as described above in comments before I cut back my sage plant which is going crazy. I did not know that I could dry the leaves like that to preserve. Kevin, I enjoy following your blog and your recipes. I took a photo, but do not see how to post it. Hi Maxine – I’m so glad this recipe worked out for you. Please post your picture on my Twitter or Instagram or Facebook page. Be sure to tag me so I’ll see the photo!